In recognition of Volcano Awareness Month (January 2013), this column explores some of the most scientifically important eruptions to have occurred in Hawai`i since HVO’s founding in 1912. Last week, we discussed the 30-year-long (and still going strong) Pu`u `O`o eruption. This week’s focus is on the 1984 eruption of Mauna Loa. The eruption began at about 1:30 a.m., HST, on March 25, 1984, after only a few hours of precursory seismic activity. The initial curtain of fire occupied the entire summit caldera and eventually migrated into the upper southwest rift zone. Within a few hours, however, the activity made a U-turn—magma began migrating into the northeast rift zone. By 5:00 a.m., the northeast rift zone vents had become the focus of eruptive activity. The eruption lasted for three weeks, feeding lava flows that reached within 6.5 km (4 mi) of the outskirts of Hilo. The 1984 activity was the first (and, so far, the only) Mauna Loa eruption to have been well monitored scientifically (which is why it is the only Mauna Loa eruption that we will cover in this month’s series of articles). HVO scientists were able to reach the northeast rift zone vents within hours of the eruption’s onset and collected detailed observations of lava flow activity over the ensuing three weeks. The work was motivated by the need to assess the threat to Hilo but resulted in a wealth of scientific insights and a better understanding of how lava flows work. Mauna Loa eruptions differ from those of Kilauea because they are usually much more vigorous. The eruption rate of lava during typical Mauna Loa eruptions is generally several times that of a typical Kilauea eruption. In fact, the amount of lava emitted during Mauna Loa’s 22-day-long eruption was equivalent to about two years of output from Kilauea! During the eruption, HVO and collaborating scientists made repeated observations at points along the lava channels that fed the flows moving toward Hilo. Data collected included lava velocity, temperature, density, chemical composition, eruption rate, channel width, and, most importantly, changes in these parameters over time. In fact, volcanologists from all over the world descended on the Big Island to study the eruption (lots of tourists showed up too!). What resulted from this intensive study was an understanding of how channelized lava flows grow and what factors control flow morphology, including the transition from pahoehoe to `a`a. In fact, the comprehensive data collected from lava flows during the 1984 Mauna Loa eruption and the resulting insights into the behavior of `a`a flows, especially, have been used to construct models that forecast how long a lava flow will extend and what path it will follow. The 1984 Mauna Loa lava flows now serve as a standard for the interpretation of older flows and for the development of flow models. It seems fitting that an eruption that posed such a significant threat to Hilo now provides the data needed to help better evaluate—and protect against—lava flow threats in Hawai`i and elsewhere around the world. 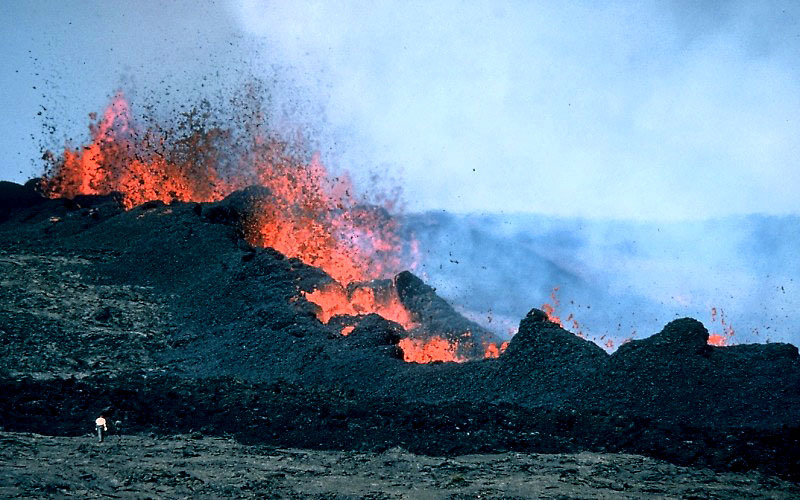 Next week, in the third part of our series on scientifically important eruptions in Hawai`i, we will focus our attention the 1969–1974 eruption of Mauna Ulu, on Kilauea’s east rift zone. Meanwhile, check out the Volcano Awareness Month activities that HVO has scheduled for this week by visiting our Web site (hvo.wr.usgs.gov) or by calling 808-967-8844.